I've been wearing my vintage snow boots all winter and now that spring is almost here, I'm excited to get into my wedges and pumps again. 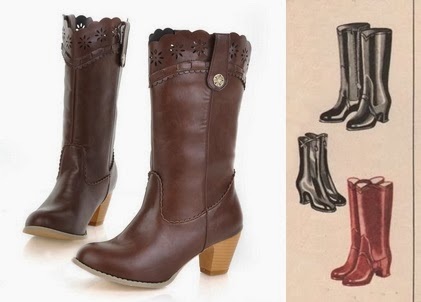 Although I'm an open-toe shoe kind of girl, there are still some occasions that call for a fab pair (or two...or three) of vintage style boots. I am so excited to start my garden again, play in the rain with my little puddle ducks, go camping and romping through the meadow at my mom's house in the country. 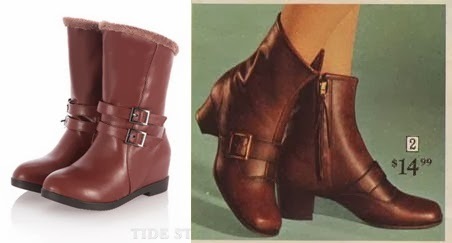 A very modern looking boot that has continued in popularity is the ankle-height stacked heel with fold-over top. 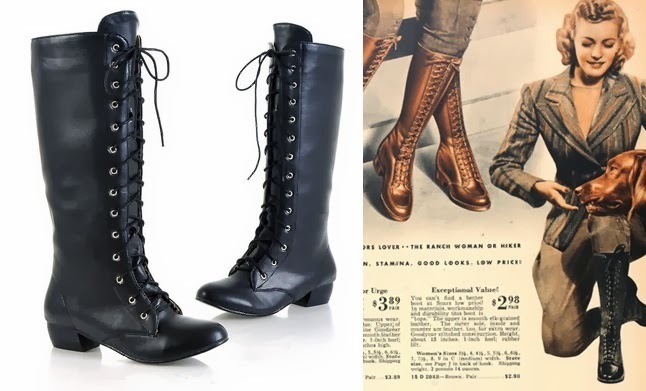 This original boot is from Firestone Footwear 1929 and like many shoes of the time, buttoned up the side.The modern boot laces up. A staple shoe for many vintage girls is the oxford heel. This great shoe suits many eras and doesn't look out of place with modern fashions either. I love a durable, low-heeled oxford like this. Replace the utilitarian laces with ribbon to dress them up. 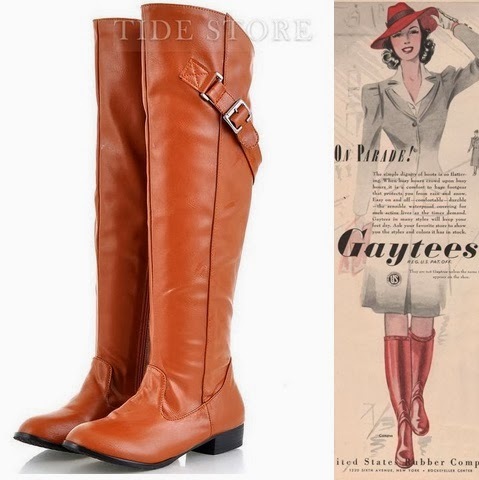 For more vintage shoe inspiration, see my pinboard, "Window to the Sole"
Oh my goodness, I'm so tickled to see those knee-high 1940s boots! And here I was thinking about donating my knee-high boots because they might not be authentic-looking. Thank you for saving my losing two lovely pair of knee-high boots that are going to come quite in handy as winter shall not be over with here for three or so months yet. 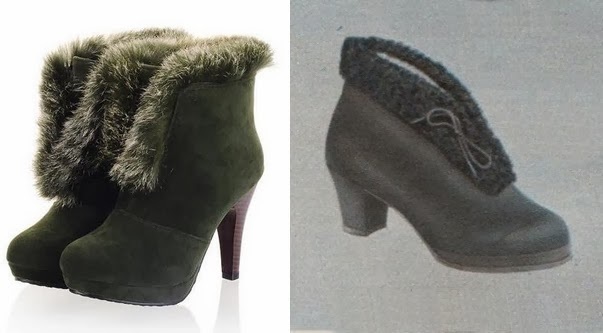 Those fur-lined ones are darling...I do wish they had a lower heel (me, of all people, saying that...). A four-inch heel is not too useful on ice. Darn! Still darling, though. Great finds, you did such a good job of matching up the vintage ones to modern counterparts. Wonderful selection! Seeing this stylish roundup reminds me of the fact that I haven't had a pair of true rain boots (as opposed to snow boots) since I was a little girl. I'd love to change that this spring. 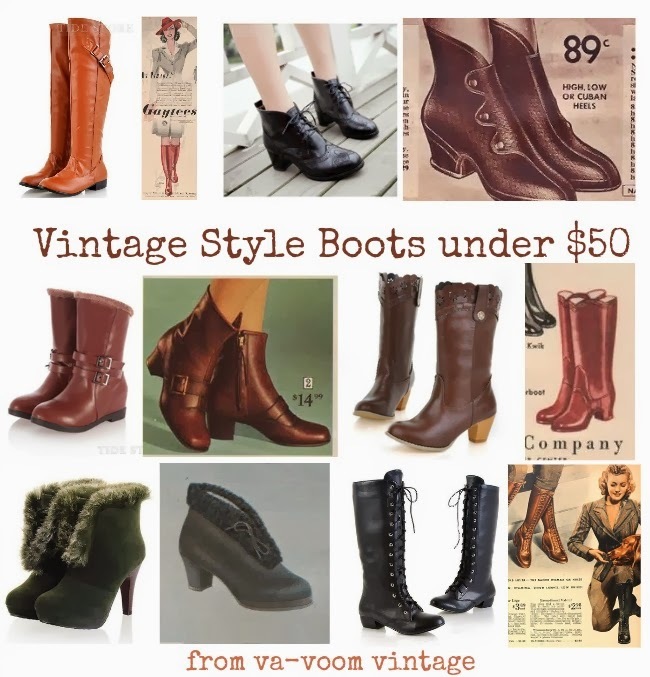 Great idea's for vintage boots! When I go out I mostly wear my non-vintage cowgirl boots. They're great in the snow, yet so me and go great with vintage dresses. Thanks for the ideas! Aren't you the cats meow. Loving the black ankle boot. Girl, you are seriously going to MAKE me get a job. Good to read ya, Brit. P.S. I'm back on the "Do I switch to wordpress.com or go to blogger.com kick. Self-hosting isn't working for this unemployed gal; gotta make a switch.